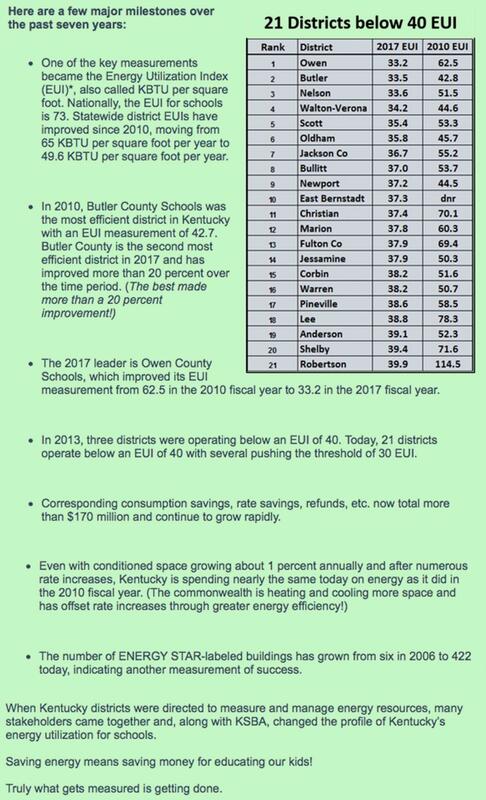 Saving $170 million is no small feat, but that is what Kentucky school districts have done by reducing energy demand and consumption. It has been said many times that “What gets measured, gets done.” With facility costs nearly doubling between 2000 and 2008, state leaders directed all districts to begin measuring and managing energy resources. While a few districts initiated local programs, this directive was the impetus for KSBA to begin a statewide program to support district efforts. 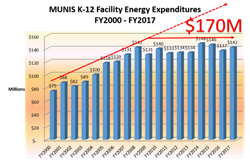 By the 2010 fiscal year, Kentucky districts began “measuring” by tracking and reporting annually the energy consumption and costs for all school facilities. Additional supports from KSBA became available and districts began understanding the complexities of managing energy resources. The graph above reflects the significant statewide success.